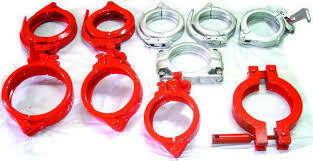 We stock many variations of clamps (couplings, clips etc) from Heavy Duty (HD) Sanche style, Victaulic, Putzmeister. Snap, bolt, quick release. From 2" to 6" (7"-8" can be ordered). Give us a call with measurements to ensure the clamp will fit your application.